This past winter I had fun painting houses and villages. My inspiration was walking through a Berkeley California neighborhood. Wondering what I was going to do with all of these little masterpieces, I decided to add embroidery and place them on a small landscape. 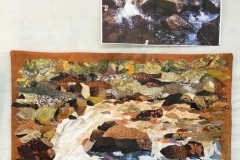 They are quilted and stretched onto a 8″ square canvas. I have them for sale at High Country ARTisans in Silverthorne Colorado. I just finished a piece that was a challenge to myself. 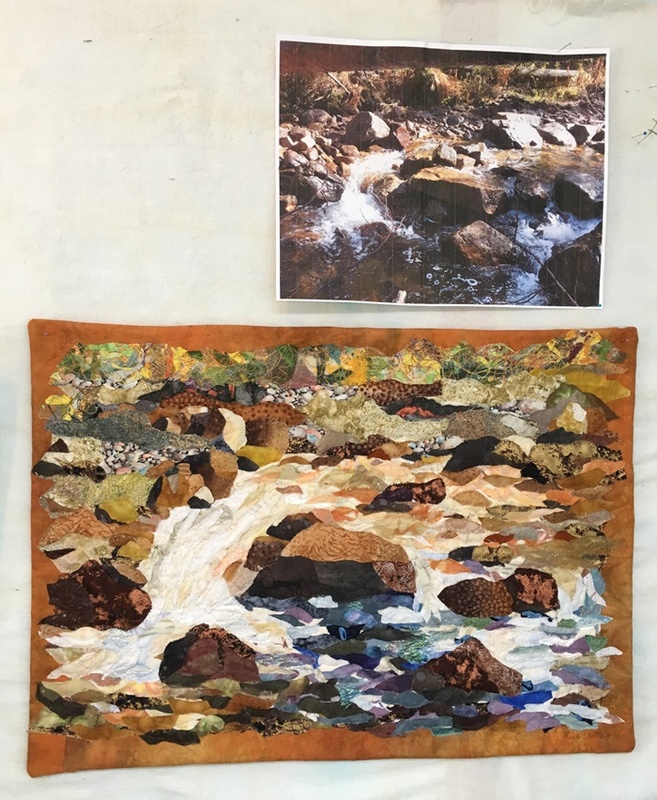 This past spring I had interpreted one of my photos of Cataract Creek into fiber art. On that piece I was pleased with the way moving water was captured. The challenge was to do it again. I took this picture of Cataract Creek in early October. It was interesting how the light was golden compared to my other picture which had a cool blue feeling. Listening to my own recommendation to “just do it”. I started placing fabric. Thinking of each piece of fabric as a brush stroke. This is mostly my own hand dyed or painted fabric, though there is some commercial fabric interspersed. These photos show the process, click on the picture, then on the arrow to see the next picture in the process. The little white dots are my pin heads, I use a insulation board as my design wall. Here is the final. I’m taking it over to Arts Alive in Breckenridge for the Trails and Paths show in November and December.